What do religious Americans really think about science? 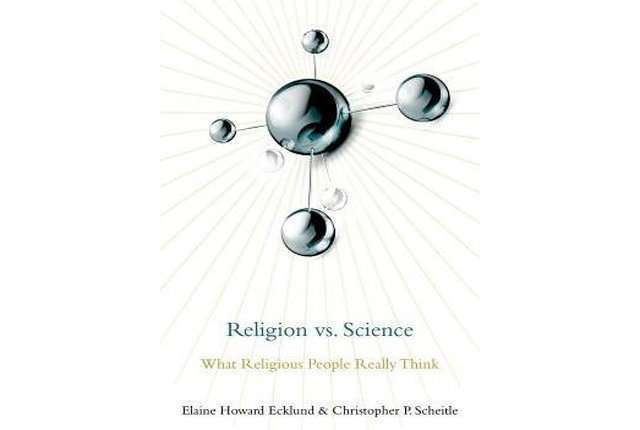 A new book from Rice University sociologist Elaine Howard Ecklund and West Virginia University (WVU) sociologist Christopher Scheitle explores and debunks widespread and consequential myths about the intersection of science and religion. "Religion vs. Science: What Religious People Really Think" (Oxford University Press, 232 pages, $29.95) follows a five-year study by Ecklund, the Herbert S. Autrey Chair of Social Sciences and director of the Religion and Public Life Program at Rice, and Scheitle, an assistant professor of sociology at WVU, to understand the relationship between science and religion in American culture. Their work focused on a range of religious traditions and faith positions. Ecklund said that the way religious Americans approach science is shaped by two fundamental questions: First, what does science mean for the existence and activity of God? And second, what does science mean for the sacredness of humanity? In short, Scheitle said, "It's about God and humans and not much else." "Contrary to popular opinions on the subject, the book shows that religious people love a lot of things about science," Ecklund said. "These individuals perceive conflicts only with the forms of science that seem to have implications for God's role in the world and the value and sacredness of humans. Yet, they are often suspicious of scientists, thinking that scientists generally do not like religious people." "Many religious people claim to be young-Earth creationists," Scheitle said. "But they are actually much more open to evolution than this initial label might suggest." Ecklund also said that not all religious people deny that the climate is changing, and that it is changing because of humans. "We found that political views more than religious views are really the best predictor of what Americans think about climate change," she said. "Religious people want to support the environment, as long as love for the environment does not replace love for people." She said that religious people are also supportive of technological advancements, including ideas that are typically controversial like reproductive genetic technologies and human embryonic stem cell research, but religious people, especially evangelical Christians, want scientists to reflect more on the moral implications of their work. "In other words, it's okay for scientists to utilize human reproductive genetic technologies to prevent disease but it's not okay for scientists to help people create designer babies. We show that Muslims, Christians and Jews who are part of the more conservative branches of their traditions—and even some liberals—all feel this way." The book concludes with practical suggestions and ideas for collaboration between science communities and faith communities. "On the whole, our research shows that the story of what religious people think about science is more nuanced than what one might think if only looking at the most extreme voices in the public sphere," Scheitle said. "Any efforts to improve relations between scientific and religious communities will go a long way toward increasing support for science and helping the natural world and the people in it," Ecklund concluded. Well, they're not wrong. Scientists deal with reality. Religious people have basically checked out of reality. It's not so much that scientists actively dislike religious people - they just can't take them seriously. It's a clash of paradigms. One side believes in reality - the other in what feels good. Grownups and kids...that's, at its root, the difference in mentality. Science, briefly the handmaiden of metaphysics and theology, measures the attributes of existence. Nonetheless, scientists tell us that at its most minuscule level matter is not measurable, or is measurable in one attribute only at the cost of precision in another, or some such thing. This has provided ever greater mastery of nature to our advantage, but yields nothing as to purpose. Beyond quarks are there smaller things, or just mathematics, or is it an infinite rabbit hole? Does it really matter? Perhaps Spinoza was correct, that there is a single substance, which he called God but which we call space, and quantum physics and time just measure the local attributes of space as it compresses and stretches into gravity (which Einstein related to curvature but some conceptualize better as density) and matter. It is good fun and awesome, but fundamentally science can only measure what it can and philosophy can only ponder what science cannot fathom. Beyond that - religion.